Sometimes apparently I run out of pose ideas so I start to dance like Elaine from Seinfeld. This doesn't surprise me. Does it surprise you? Didn't think so. Or maybe I'm just excited because Lottie got a new collar, leash, and sweater! Lottie is my family dog, the sweetest of sweetie pies. A real darlin', that girl is. This Christmas she got a new red collar and my grandma knit her this adorable sweater. 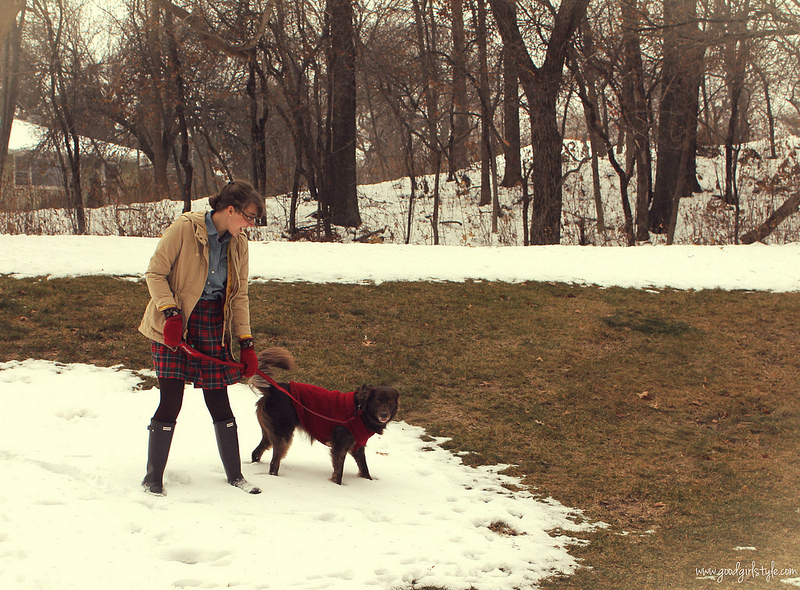 Lottie has never lived where there are major snowstorms, so she absolutely loves her cozy new outerwear. She also got this fancy new leash. This leash is the real deal. Made by PAWW, a sister company of HumanGear, it is high-tech and human-savvy. 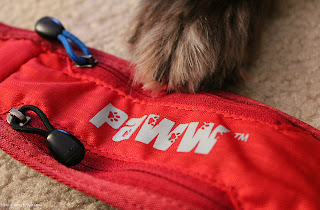 The workmanship is stellar, and the leash is made out of double rip-stop nylon (often used in mountaineering equipment), which means if you were lost in the wilderness and needed to go all Bear Grills for some reason, you'd want this leash with you. It's that tough. Obviously, I'm not recommending you use this leash in any sort of mountaineering, other than taking your dog on a nice long walk in the woods. Dogs dig that sort of thing. And with the Paww Pick Pocket Leash, you will too. This intuitive, "civilized" leash keeps your doggie necessities right at hand. There is a built-in bag dispenser for doggy bags, and a zippered pocket for cash, a key, or better yet, a treat for your pup. 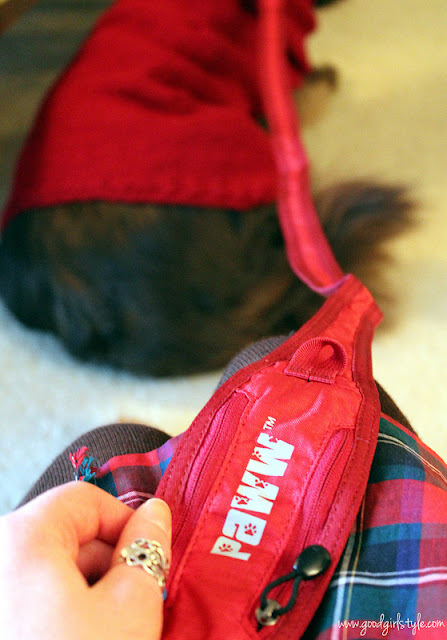 The top clips around a post if you need to leave your pooch outside for a quick run to the store. There is a handy "utility loop" on the top that can be used to attach a flashlight, a used doggie bag, a toy, or whatever else you need to bring to the dog park or on that walk in the woods. My only complaint with this leash is that we were taught in our dog's fancy training classes to always hold the leash with two hands, one wrapped around the leash and one farther down (that's hard to describe in words). The high pocket placement makes it a bit hard to hold the leash in this manner. 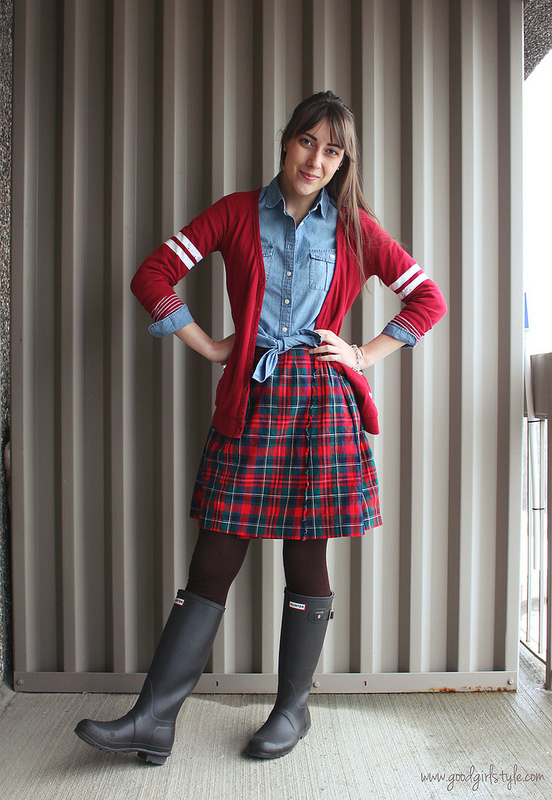 I think it might be nice to have the pocket closer to the collar, or perhaps adjustable. But we haven't stopped using this leash on account of that....no way! It's clear with one look at this leash that it is the gear of choice for dogs and their owners who appreciate style and practicality. This leash means business. It also means "extra long walks for Lottie." 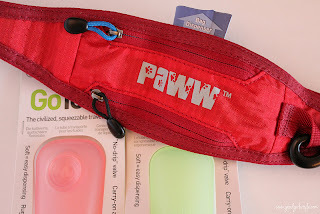 Many thanks to Katrin from Paww/HumanGear for letting me review their great products! This is my honest opinion in my own words. That looks like an awesome leash! You and Lottie are adorable. 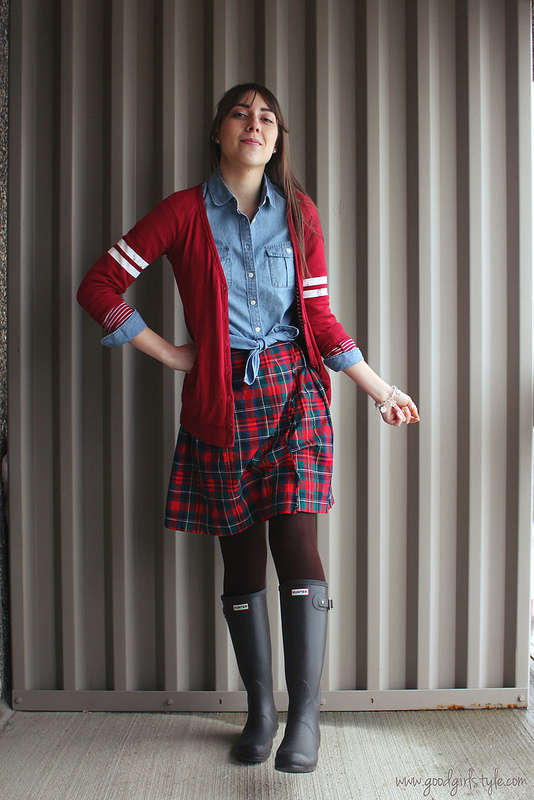 Aww Natalie I love to see you wearing your Wellingtons sweetheart you look really adorable. Thanks, Christen! She really doesn't like having her picture taken, it's so funny!